"Jon Cleary is the ninth wonder of the world." "Quite possibly the tightest funkiest band in a city swarming with such superlatives." "Having fun with the songs of Allen Toussaint," Jon Cleary has chosen a mix of popular and less familiar pieces penned by legendary songwriter Allen Toussaint to re-imagine, like the lesser-known title track as well as better known tunes like "Southern Nights," "Everything I Do Gonh Be Funky," and "Fortune Teller," most recently made popular by Robert Plant/Alison Krauss. In the hallowed ranks of New Orleans "piano professors," Jon Cleary is on the tenure track. 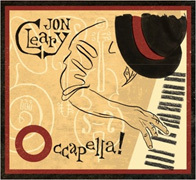 Born in England and bred in New Orleans, Jon Cleary is a triple threat combining soulful vocals, masterful piano skills, and a knack for composing infectious grooves with melodic hooks and sharp lyrics. He balances performing - solo on piano, with his new trio The Philthy Phew and noted funk band The Absolute Monster Gentlemen - alongside a longstanding career as a notorious hired gun with the likes of John Scofield and Eric Clapton. His performing and recording credits also include work with B.B. King, D'Angelo, Taj Mahal, Keb Mo, India Arie, Ryan Adams, and former band leader Bonnie Raitt who has covered Cleary originals ("Fool's Game," "Monkey Business," "Unnecessarily Mercenary," and "Love on One Condition"). ★2013 OffBeat Best of the Beat Award Nominee for Best Piano/Keyboardist - an impressive fifth year in a row. ★2012 OffBeat Magazine Best of the Beat Award Nominee for Best Piano/Keyboardist. Band members James Singleton and Matt Perrine were also nominated for Best Bass Player and Best Tuba / Sousaphonist respectively. ★Featured in Season 2, Episode 20 of HBO's Treme, performing "Frenchman Street Blues" and Season 1, Episode 9, performing "When You Get Back"
★Touring member of Bonnie Raitt's band since 1999 and appeared on the albums Silver Lining and Souls Alike. On these recordings, Raitt covered the Cleary originals, "Fool's Game," "Monkey Business," "Unnecessarily Mercenary," and "Love on One Condition." ★Toured with John Scofield and featured on vocals and keyboards on the recently released, Piety Street by John Scofield & The Piety Street Band.